Have you ever seen the Blue Angels perform their Flying Stunt Show? It’s an awesome, as in awe inspiring, sight. My kids and I watched from a friend’s rooftop on Van Ness in San Francisco. The jets flew so low over us a couple times that we could read the numbers on the tail of the aircraft. My kids cowered from the boom. The building vibrated. And I couldn’t help but catch my breath thinking about their brilliance, grace and strength. It was a strange feeling. I’m what you might call a Peace Freak. In the 1980’s, I registered Green to help get them listed as a new political party. I attended rallies against The Gulf War in the 90’s. Since I had children, I find it even harder to imagine sending our young people to war. In 2003 I collaborated with theatre companies in the Napa Valley to present a reading of Lysistrata along with theatres all across the world in protest of our launching war in the Middle East. But as I stood there on the roof in the sunshine in San Francisco watching the Blue Angels whoosh by me with a vibrating boom above a picturesque sailboat-dotted-bay, I was proud, in awe, and hopeful. On the heels of the last few weeks’ economic and political news, we’ve watched our country descend into the worst economic turmoil in our lifetime. Politically, divisive and hateful speech has become common at some rallies; stirring a frightening and toxic force among our citizens. 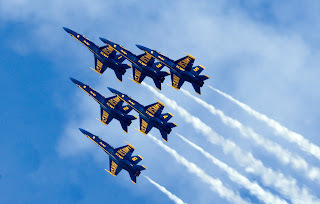 Watching the Blue Angels reminded me of our potential, our better selves. This seems ironic to me since they are also part of our military and as I said before, I’d prefer peace, in a big way. So here they were in our fair city, people gathering to be together to watch this spectacular display of artistry and science and skill. It’s one of those moments you remember forever. Maybe the Blue Angels in context within the rest of the political and economic muck and despair was jarring. Maybe it is a time when their artistry, science and skill can be especially appreciated. And maybe coming together with everything aligned under an amazing display of strength, grace and leadership is what we need more of right now. I’ll be looking for it, imitating it and finding it. 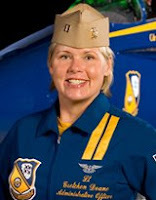 Lt Gretchen Doane & LCDR Mark Lambert, photographs above are Blue Angels Officers. I looked into the history of the Blue Angels a little since they stirred my curiosity. 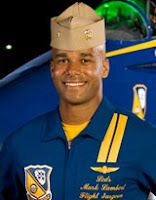 The average age of a Blue Angels pilot is 33 years old. The F/A-18 can reach speeds just under Mach 2, almost twice the speed of sound or about 1,400 mph. The maximum rate of climb of the F/A-18 is 30,000 feet per minute. The jets bear the official colors for the U.S. Navy.